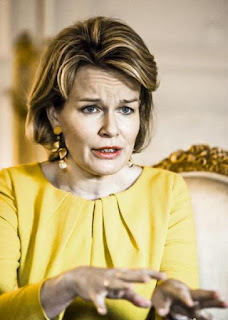 Queen Mathilde: "2030 is tomorrow. Change has to happen today"
Queen Mathilde gave an interview to Belgian MO Magazine on the SDGs. (...) What made the queen help shoulder the SDGs? What does she hope to achieve? She gives an extensive answer to these questions in a long interview with MO. Our interview takes place at the royal palace, in the very heart of Brussels. When photographer Brecht and I are taken to the first floor by an assistant, we notice an impressive bronze of Leopold II: with a straight back and a self-assured look he isn't hindered by the violence that's being committed in his name among the Congolese people. The dilemma of this conversation on sustainable development goals coudn't have been presented more clearly - even though it turns out Leopold II is just a visitor. The Africa Museum of Tervuren is being renovated and had to look for temporary accommodation for Leopold, and who else has a hall big enough to fit a statue of these dimensions? Has the queen ever made a humanitarian visit to Congo? And how much does the fact that Belgium or the Belgian royal house were actively involved in the country's colonial history play a part in deciding wether or not to make such a visit? I asked this question afterwards and the answer clearly shows the lines the queen's international role has to follow: "The queen has never been to Congo. Every field visit is decided in collaboration with the minister of foreign affairs and the minister of development cooperation. Both the political situation and the safety aspect are taken into account. For the time being such a visit is not relevant." But our interview never had the same diplomatic reserve, on the contrary. I was prepared for an interview where formal answers would be given to general questions before we would reach the queen's personal reasons, her doubts and contradictions. But as soon as queen Mathilde comes to get us from the antichambre and as she takes us to the place of our interview, she starts to talk about her recent state visit to India. She tells us how impressed she was by the girls she spoke to in Dehli. Which brings us immediately to the question: Why does she go to the very bottom of society, and what does she hope to be to underpriviledged people? The answer starts with Mathilde's mother's family history. She describes Anne Komorowska as a Polish woman who fled the communist regime. Mother was a countess, but during those nomad years, that also briefly took her to Congo, she knew poverty and hunger. A trauma that never healed, and that was made clear from the absolute prohibition to spill or waste food in the d'Udekem d'Acoz household. When she was 18, Mathilde frightened her parents with her holiday plans: she wanted to spend the summer months of 1991 in Cairo. She would go there on her own to work with a local NGO in the slums of the Egyptian capital. "I still remember the road, the dust, the smells. That summer changed me and made me into the person I am today"." "I wanted to go alone. I knew that the chance of meeting people and opening up to their experiences would be greatly limited if I was accompanied by a friend". Mathilde did all the jobs that such an experience entails: building a local school, teaching French, helping children, walking for hours along dusty roads to the next activity. "I still remember the road, the dust, the smells. That summer changed me and made me into the person I am today". Later Mathilde would learn that you don't have to cross the Mediterranean to meet extreme poverty. As a speech therapist, her house calls were also made in the rue Blaes in the Marolles, and showed her loneliness also exists in Evere. She talks with great delight about how prince Philippe accompanied her as an 'advising doctor' during a house call to a man with throat cancer. "It was emotionally hard to say goodbye to my job and my patients. To all the persons who empowered me through their resilience, in spite of the difficulties they had to live with". "It was emotionally hard to say goodbye to my job and my patients. To all the persons who empowered me through their resilience, in spite of the difficulties they had to live with". It was during her time as a speech therapist that Mathilde started to study psychology because she wanted to have a better understanding of the people she worked with. She continued the study when she became a princess and finished when her oldest daughter Elisabeth turned 1 year old. She wrote a thesis on the identity developments of delinquents. Her speech therapy thesis dealt with the ways parents (can) approach their autistic children. "I've never had the chance to work as a psychologist, but I can use the insights I gained in my work for Unicef, or in projects that support education and mental health care." And at once the Indian women and girls enter our conversation again. "My recent encounters in Dehli reminded me of another meeting I had in Mumbai, 10 years ago. I spoke to a woman who had travelled hundreds of kilometers, she talked to me about the way microcredits had changed her life. They had enabled her son to study. I will never forget that woman's eyes". Investing in education is key: the queen repeats it time after time - especially educating girls, because "it has a direct impact on the entire family and the local community". She asks: "Did you ever meet Ellen Johnson-Sirleaf?". Johnson-Sirleaf was president of the West African country Liberia from 2005 to 2017. When I tell her yes, that we published an interview with her in 2011, the queen is visibly pleased. "Such a strong lady. So committed. And she's such an example for a country that had to rise from its ashes. When I can lend my support to women like her, in the battle for women's rights and more education for girls, I feel really happy." She adds at once that the force she so admires in Johnson-Sirleaf isn't just to be found in Africa or in women in high ranking positions. As she does often during this interview, the queen talks about poverty in Brussels. She underlines how strong women - and men - can be here too. Despite poverty and dire circumstances. Like in Haiti, where Mathilde was in 2012. "The Haitians have really gone from one disaster to the next. Still they don't give up. I visited a hospital where cholera patients were being treated. They had as good as no provisions, the most vulnerable children were kept in quarantaine, and still." In the course of our conversation we discuss the obvious gap between the lifestye or material wealth of the royal family and the hard reality the people Mathilde wants to put her energy to face - from West African girls to generational poverty in the Marolles. "I live in these buildings of course", the queen replies, avoiding the word 'palace' but pointing at the large room where our talk takes place. We're seated in gilded sofas and behind the queen's back hangs a perfectly polished mirror that's several meters high. It reflects a state portrait of Leopold I - probably no coincidence. Gold is everywhere in this room, on the framing of the door, on the dresser, on the black mantlepiece, even in the details of our coffee cups and in the queen's earrings. The light that comes in from the Place des Palais falls through the high windows and is being softened by lace and curtains. It gives our room a rich, warm light that adds to the cristal chandeliers and cleverly placed table lamps. 'These buildings' aren't really decorated to be pompous, but inevitably they exude a luxury that recalls generations of aristocratic living. The gap between rich and poor is something the queen is well aware of, but when she's on a field visit the main thing she wants to do is listen to people, she says. "People give me life lessons on hope and resilience". Other than that, she wants to "give what I can with my whole heart: time, dedication and dignity". When I write this down I realize how mellow it sounds. But Mathilde looks you straight in the eye, and you think: she's serious about this. It are nearly always women or girls, mothers or children, who play a central role in Mathilde's examples when she talks about her commitment to sustainable development. On the little table behind her I see a photo of her own children, who sit on a large tree trunk like the four sons of Aymon. Healthy children. Priviledged children. She doesn't say so, but she surely knows it. "In Ethiopia I met two mothers in a small room, each with their child. One of the children was busy playing a game, the other was completely still and apathetic. It was 5 years old, just like my youngest at the time, but it had been malnourished and the damage was beyond repair. I tried to touch the child, but it gave no response. Can you imagine being a mother and seeing that your child's life is over when it's barely 5? Unrepairably over?" "Can you imagine being a mother and seeing that your child's life is over when it's barely 5? Unrepairably over?" Mathilde wants to be confronted with reality. In Liberia, Haiti, Laos, India, and more recently in Ghana. She doesn't want it out of self harm, she wants to base her efforts on real life experiences - even though she probably knows that each visit a queen and her team make is the result of an orchestrated reality. The meetings are well prepared, the locations are carefully selected, the projects have been screened. "I can talk about poverty and underdevelopment, but it's really different to experience reality. To witness it with your own eyes. It makes you fully realize that poverty isn't a passing accident. It undermines the physical and even cognitive development of children for the rest of their lives. Investing in food for children is an intelligent investment in a country's economy. Realizing this means you can commit a lot more to the cause." These meetings turn the humanitarian work into a personal thing: "It changes a person in need into a real person with a past and a future. And most of all: it changes him into someone with human dignity." Mathilde explicity adds: "That's why I always tell my children to look the people they shake hands with straight in the eye. A way to acknowledge someone's dignity." She does what she's talking about, at that very moment: she looks straight at me - when I look up from the notebook where I write down what she's saying. Because court's protocol woudn't allow a tape being made of the interview. Mathilde doesn't just want to be a first class volunteer. She invests a lot of time in literature, she says: books, reports, studies and research. And MO Magazine, of course. She frequently asks briefings from NGOs, "to remain up to date with people who have been hit the most by poverty and exclusion". It was former UN secretary-general, Ban Ki-Moon who asked the queen to become an SDG advocate. Ban was no stranger to Mathilde. She met him at UN conferences and during his visits to Brussels. He knew her and her main fields of interest: children, education, development, and girls. "It was an honour to be asked to help promote these goals internationally," Mathilde says, "because 2030 is on our doorstep. Change has to happen today." At other moments in our talk she says the same thing, but using the multilateral institutions' jargon: "The time of declarations is behind us. Now it's time for us to implement agreements." I had hoped for some stories about the meetings of the global SDG Advocates. About the queen chatting with Lionel Messi about the ever dissapointing results of the Belgian teams in the Champions League. Or about the time she discussed her kids' musical taste with Shakira. But the 17 advocates have never been together in the same room, even though the queen herself was the one to organize a meeting of a number of them last year, at the European Development Days. It didn't include the TV celebrities, but it did bring together the development celebrities, like Nobel winner Leymah Gbowee, Jeffrey Sachs, deputy UN secretary-general Amina Mohammed and Nobel winner Muhammad Yunus. With minister De Croo, European Commisionary for International Development Neven Mimica and other political, societal and industrial leaders they discussed the ways to make their agenda for 2030 more visible, and to increase its success. But alas, that's no source for gossip. You need only glance at the SDGs to see that Mathilde focusses on SDGs 3, 4 and 5: Ensuring healthy lives and promoting the well-being for all at all ages. Obtaining a quality education and increasing enrolment rates in schools particularly for women and girls. Achieving gender equality and empowering all women and girls. These goals succeed the Millenium Development Goals that were proclaimed in 2000. The MDGs were, up to 2015, a guide for the international community and the national governments to invest in developing the South. "None the less, each of the 17 goals is important," Mathilde confirms. Because "the SDGs change the conversation about North & South, with changes needed in the South. Now we talk about an inclusive, universal story where all of us are responsable for the future we have in common. The 'developing world' becomes a real actor, and the business world is being asked to be responsable." "Intuitively, young people are very conscious of the 2030 agenda. And they know their input doesn't always have to be massive, as long as it is real." "We have to be consequent", Mathilde adds. Practice what we preach. She doesn't mean to call on the Belgian government to finally put together a coherent policy on development aid - the queen is not allowed to tread on the terrain of the democratically elected government - yet it's a personal appeal. And she sees that the younger generations are particularly sensitive to this nowadays. "Intuitively, young people are very conscious of the 2030 agenda", the queen says in perfect UN jargon. "And they know their input doesn't always have to be massive, as long as it is real. The question is: are we giving their daily humanity and input enough visibilty?" Isn't there a growing cynism, apart from the idealism that emerges from the bottom-up, I ask Mathilde. A cynicism that's being fed by the incapacity of governments to really tackle climate change, for instance? Mathilde doesn't deny my question, but offers a positive perspective: "Much has changed for the better these past years. Child mortality rates have halved, maternal mortality has been reduced severely, many more children go to school... The challenges remain huge, but we should also look at what has been achieved and let it be the basis of our investment." She herself finds strength in the hopefull perspective of what she sees when she makes field visits, by witnessing with her own eyes how people - even those who have nothing - try to improve society. "I don't want to lock myself in negative thoughts. I prefer to focus on what's positive and realistic. The resilience of vulnerable people, their ability to rise time and time again, to find the strength to survive... that's what I admire." To illustrate that indestructable life force she's talking about, Mathilde tells me the story of a 55-year old man she met recently: "His face was a reminder of the painful life he'd led. A crooked nose from a violent youth, with a father who had broken every bone in his son's face. He'd been left on the street in a coma. He grew into a thug and worse. He knew every juvenile court judge in the wider area. Untill one of those judges looked him straight in the eye and said: you've got the brains to get a degree. That one time where someone believed in him made all the difference. He told me: I existed in the eyes of someone. And yes, he got his degree and finally showed it to the judge to prove he was capable of it. Now he's married. With his wife he runs a youth shelter for kids with a difficult background." The queen is passionate about these kind of stories, she loves to tell them. "And then there was this tiny elderly lady, from Budapest. As a 16-year old she was sent to Auschwitz. She lost everyone in the camp. I don't know if I've ever seen such powerful eyes - anyway she impressed me so much that I decided to visit her with my children. We made a 700 kilometer drive deep into the heart of France, so my kids could hear her story - and her message of hope." "I decided to visit the elderly lady with my children. We made a 700 kilometer drive deep into the heart of France, so my kids could hear her story - and her message of hope."" "I've seen hell", the lady told us. "But even in hell humanity exists and survives. A dying woman gave me her bread and ordered me to survive." She also told us how her father, before the war, never asked about her school results. Instead he asked if she has asked the right questions in class that day. She assured my children: "That's the most important thing you can learn as a child, a teenager, a human being: to ask the right questions." Mathilde's motto about her investment in the sustainable development goals is one she got from Ban Ki-Moon, she says: "No-one is left behind." That's why she says education and health are crucial. Specifically mental health, she adds. "Because children who survive conficts and violence don't just lose their traumas. They have to heal, or they will suffer their entire lives." She's so motivated about the SDGs because they assemble all actors: government, society and business life. "Together we can make the difference", Mathilde believes. When asked if she ever confronts the Belgian government with their inconsistent policies, or with the cuts they make in social security or development aid, the queen replies with a royal smile and similar diplomacy: "I'd rather put my energy to encouragement than to reproaches." Interview Gie Goris/ Photos Brecht Goris. Thanks a lot for this post SDG's is also a passion of my own. I most admire all royals that advocate SDG's and I will do a post on my blog about this interview with proper credit to you for letting me know about this and put it in english. All the best.